Neue Retro is a sophisticated style that has a softly scuffed texture in the background, the border and the main fonts. The background texture is a grid like paper that softly appears and fades, with random scratches, across the sheet. The main font is bordered by a frame that is made of multiple textured bands of color and shades of grey. Soft color variations and boxes and frames define this style. Overall, it is sophisticated and simple, rustic and elegant, all at the same time. 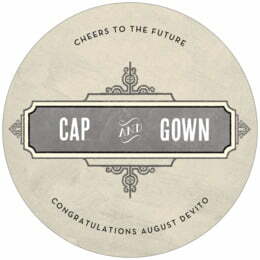 Customize your Neue Retro graduation coasters today to celebrate your hard-working grad! Neue Retro graduation coasters are available in multiple shapes—3.9" round, 3.9" square with rounded corners, and others. They are extra-thick, 58-point paper board. To give you an idea of how thick they are, a stack of a dozen coasters is about 3/4" tall. They are made of absorbent pulpboard to help protect your tabletops and counters. The coaster surface is coated with a smooth matte coating to provide beautiful, crisp printing. Evermine graduation coasters are individually die-cut, so their top has a soft and rounded edge. They are designed to be disposable, but they are durable and re-usable. If unused, they can be kept as keepsakes and will last forever. Graduation coasters are printed on the front side only. On the blank back, a small Evermine logo is debossed (not printed with ink, but simply pressed into the soft pulpboard paper). And our graduation coasters come beautifully packaged in boxed sets of a dozen; they are great to give as a gift, or simply hand them out to guests or scatter them on your tabletops. 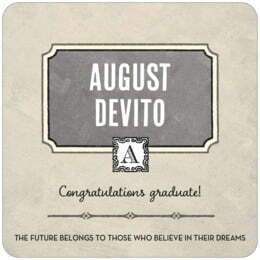 Click on "Personalize" to start customizing Neue Retro graduation coasters for your graduate today!